Attention: This article is under construction. The editors are doing their best and are now preparing to finish the article. Please watch warmly until it is ready. Stage enemies (also general enemies or generic enemies) are characters, creatures or other objects that appears in-game and that they fly onto the screen and shoot danmaku at the player. They are a lower rank to a boss or a midboss of the games. A majority of enemies are nameless and are thus only referred to by an identification, sometimes they'll even not have identifications. Characters such as Lily White have appeared as a general enemy. This is a list of known enemies that've appeared in the Touhou Project and other related series. Stage enemies are usually trivial to deal with compared to their boss and midboss counterparts. However, they haven't got a health bar of some sort to tell the player when they're defeated. 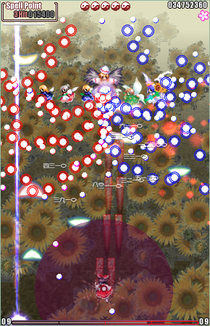 Depending on the game, stage and difficulty, various enemies will appear and shoot danmaku that are either simple, brutal or vigourous, making the player to memorise the patterns in order to dodge the bullets, along with giving different scores. The player must defeat these enemies as quickly as possible in order to minimise dodging time. However, there are some cases, where defeating an enemy will result in a "return bullet", where defeating them are unnecessary if they didn't shoot bullets to begin with (a notable example is the vengeful spirits on stage 5 of SA). However, this doesn't give points. Some enemies, such as the Sunflower Fairy, have acted as a "mini-boss", a rank between the normal stage enemy and a midboss, requiring the player the defeat such enemy to proceed or minimise dodging time. Enemies will score points to the player's overall hi-score. They'll even sometimes provide various items that the player can collect, such as a P power-up, graze, a bomb or a 1-up. These can change to different drop items depending on the player's status. However, no enemy is thus far shown to hold a spell card and that the enemies actually have little aspect towards the Touhou Project, since characters and music is the series' main attention. ZUN has occasionally used the term zako (ザコ), or its kanji form "雑魚", which literally means "small fish" or "small fry". This term in its kanji form actually refers to the coarse fish, while the katakana form isn't an actual word with an actual meaning, but in video gaming, it loosely means "trash" or "rubbish". More specifically, it's referring to small enemies in video games, so the best translation is "general enemies" or simply "enemy". A lot of known enemies have no name or identification upon them to be referred to. However, the fanbase has given them such identifications, such as Hoshizako. Enemies like these use zako as a suffix to reflect their status. Almost all enemies literally have no portrait to show them their appearance at best, and thus only exists as sprites. Like Koakuma and other characters without artwork, the fanbase speculates their appearance that's shown in artwork. This page was last edited on 1 April 2017, at 00:28.